With some record breaking temperatures throughout most of North America, many of us are dreaming of going to warmer climates to fish and our newest addition to the Rod Glove Pro Staff, Amanda Mayhew did just that. The Rod Glove's Amanda Lynn Mayhew, host of Just Hunt, along with Canadian Sportfishing Italo Labignan spent some time fishing the warm waters in Florida for an upcoming show called Here's the Catch. Amanda Mayhew is passionate about the outdoors and has spent many hours hunting and fishing while acting as a role model for many women looking to get into the sport. We are fortunate to work with Amanda Lynn this season and her year has started great already by spending some time saltwater fishing. Going out with Italo Labignon, host of Canadian Sportfishing she was able to not only fish but had a chance to get up close and personal with some bottle nose dolphins. 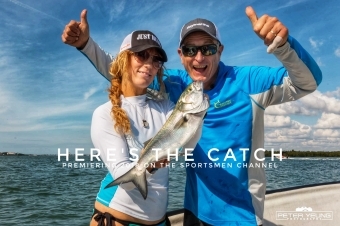 Amanda Lynn is the spokeswoman for the Toronto Sportsmen Show and can be found on stage this season representing both hunting and fishing seminars. She will be representing both The Rod Glove as well as X Zone Lures and we look forward to working with her this season. She will be fishing this season in her 2018 Crestliner Discovery 1450 fishing on her home waters with locals as well as industry experts. For more information on Amanda Lynn or to become a fishing addict check out www.justfishaddict.com. I've been using Rod Gloves for 5 years now, and they are the best premium rod protectors in the industry. The specially designed tapered tip is unique and effective. Rod Gloves protect my Daiwa rods from damage when riding in rough water, and they look cool too!